We’d love your help. Let us know what’s wrong with this preview of Dark Harvest by David L. Thompson. Bodies quickly fill the morgues on both sides of the Detroit River following multiple attacks against this vital international border. Mustafa Suleyman, a man hunted by every law enforcement agency in the West, appears to have arrived on America’s shores. A war-room at the FBI’s head office in Washington is quickly established. Bradley Parsons, the head of Counterterrorism Bodies quickly fill the morgues on both sides of the Detroit River following multiple attacks against this vital international border. Mustafa Suleyman, a man hunted by every law enforcement agency in the West, appears to have arrived on America’s shores. Enter for a chance to win a copy of DARK HARVEST by David Thompson! Bodies quickly fill the morgues on both sides of the Detroit River following multip Enter for a chance to win a copy of DARK HARVEST by David Thompson! Bodies quickly fill the morgues on both sides of the Detroit River following multiple attacks against this vital international border. Mustafa Suleyman, a man hunted by every law enforcement agency in the West, appears to have arrived on America's shores. A war-room at the FBI's head office in Washington is quickly established. Bradley Parsons, the Head of Counterterrorism, is now in charge. He knows Mustafa Suleyman's capabilities better than most. He has tracked him for years, and while he prays for the best, he quickly prepares for the worst. But nothing can prepare Parsons for the call that he receives from a highly unlikely source. a call that changes everything. Matt, who is currently #49 on Goodreads Best Global Reviewers list, wrote: "In a political thriller with strong terrorist themes, David L. Thompson dazzles readers with an intricate storyline and well-developed characters." To ask other readers questions about Dark Harvest, please sign up. In a political thriller with strong terrorist themes, David L. Thompson dazzles readers with an intricate storyline and well-developed characters. After terrorists attack a Montreal church, the world takes notice. The FBI wonders from across the border if a prominent terror cell may be behind the attack. When a major explosion rocks the bridge connecting Detroit and Windsor, all eyes turn to the Feds, apparently asleep at the switch, especially after events the previous day. As a Deputy Director In a political thriller with strong terrorist themes, David L. Thompson dazzles readers with an intricate storyline and well-developed characters. After terrorists attack a Montreal church, the world takes notice. The FBI wonders from across the border if a prominent terror cell may be behind the attack. When a major explosion rocks the bridge connecting Detroit and Windsor, all eyes turn to the Feds, apparently asleep at the switch, especially after events the previous day. As a Deputy Director, Bradley Parsons is forced to take much of the blame, though he tries to make it clear that he has been working with limited resources. As SCIMITAR claims responsibility for the attack, there is more to come. One of its leaders, Mustafa Suleyman, warns of a major attack on the D.C. area, which will likely include Sarin gas. Mass panic ensues as Parsons tries to mobilise and discover where the attack is centred. As numerous smaller cells begin to lay the groundwork for the attack, Parsons debates taking the ultimate steps that will neutralise SCIMITAR once and for all. 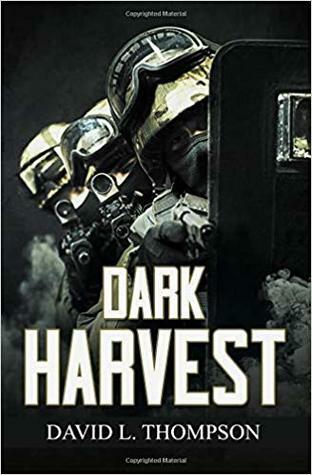 With other attacks around Europe and into the Arab countries, Parsons convinces the US President to begin Operation: Dark Harvest, a multi-state initiative that may be the only hope to end the violence. With the help of Europe and Israel, it may work, but there remains the problematic attack slated for D.C. Time is running out and Parsons has more than himself to worry about, forcing him to work in conjunction with others to ensure the region is safe and SCIMITAR disappears once and for all. However, terrorism is more like the Hydra, resuming its efforts as soon as one cell is dismantled. Parsons will have to act quickly and with all the force he can to ensure success. Thompson does well to keep the reader engaged throughout this high-impact thriller. Perfect for fans of terrorism novels, especially those who like a new spin on an overworked theme. I just finished reading the book Dark Harvest by David Thompson. I found it fast paced, factual, interesting and entertaining. A well written book! I was hooked from the beginning with it's Canadian locations to the epilogue where I am hopeful that a sequel will continue with the lives and stories of my favourite characters. Absolutely binge-worthy! I was caught from the beginning---A very topical and suspenseful read, reflective of the challenging times we are living in. I was drawn in from page 1 and had to binge through to see how it ended! I thought the story was immediately engaging. The genre is reflective of the current tensions between radical religious terrorism and the US, with a hero whose insight into the Middle East gives him a unique insight and understanding. The struggles he experiences in trying to w Absolutely binge-worthy! I was caught from the beginning---A very topical and suspenseful read, reflective of the challenging times we are living in. I was drawn in from page 1 and had to binge through to see how it ended! I thought the story was immediately engaging. The genre is reflective of the current tensions between radical religious terrorism and the US, with a hero whose insight into the Middle East gives him a unique insight and understanding. The struggles he experiences in trying to work with competing agencies to stave off a catastrophic threat will resonate with anyone who has found themselves stymied by bureaucratic red tape--anyone who has tried to "herd cats" will empathize! I thoroughly enjoyed this suspenseful and fascinating story in David L. Thompson's first book of the series. It provides insight and delves into the history of the issues from centuries past up to today. Highly relevant and an exciting read. I just wanted to keep reading the book until it was completed. Can't wait for the sequel.